Last day's walking in Switzerland, over the border into Austria first thing in the morning. 16 days from one side to the other, not too bad. Today was exactly the same as yesterday. Flat walking along the side of the lake. Looking at my fairly limited collection of pictures for the day, one of the many things they fail to capture is the mass of semi-naked bodies I was stepping over as I walked along. Not sure if my motives would have been properly understood so I kept my camera to myself. The other thing they miss are the number of bikes. 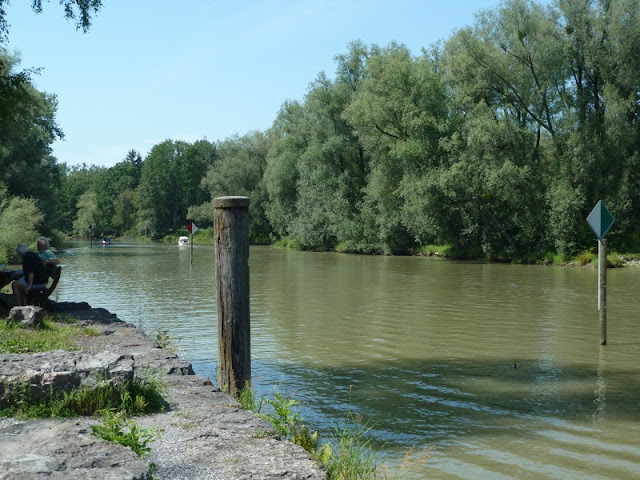 There are several long distance cycle trails around here, one seems to take you down the Rhine, and when you share the trail with one of these routes the bikes are literally flying past you all the time. I guess this is also the start of the holiday season, it took me three attempts to find a hotel that wasn't booked up. The walk itself was not that much to write home about, very hot, lots of hard surfaces and my feet were again sore as I finished. It is amazing what a difference the surface makes, I was knackered after walking on the flat for 7 hours which on the face of it should have been an easy day. 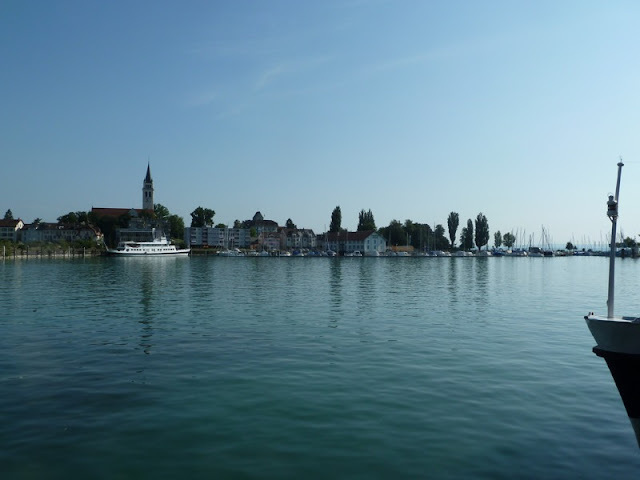 Left Romanshorn at about 9. Actually had a brilliant nights sleep despite the proximately to the station. Dodgy breakfast, centre piece of the spread was a large bowl of rotting bananas surrounded by squadrons of tiny flies on guard duty. Romanshorn got better as you left it. 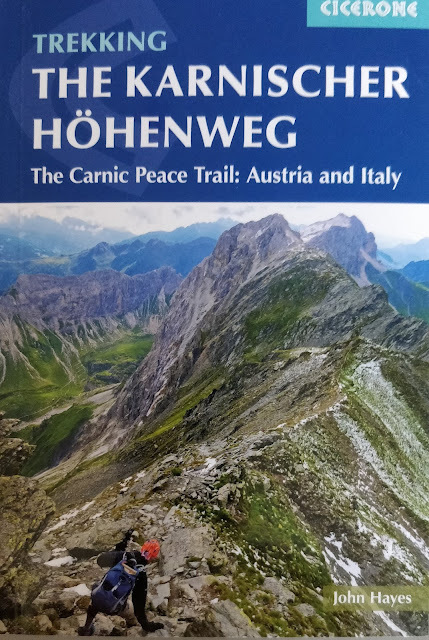 Just like yesterday the walk then took you through a series of resorts, Arbon, Steinach and Rorschach. Just past Rorshach, which was the largest resort, maybe at Staad, there was a huge railways works where the very same trains that have been flying past me on the local line for the last few days are built. The Swiss clearly don't let the Germans build their trains. 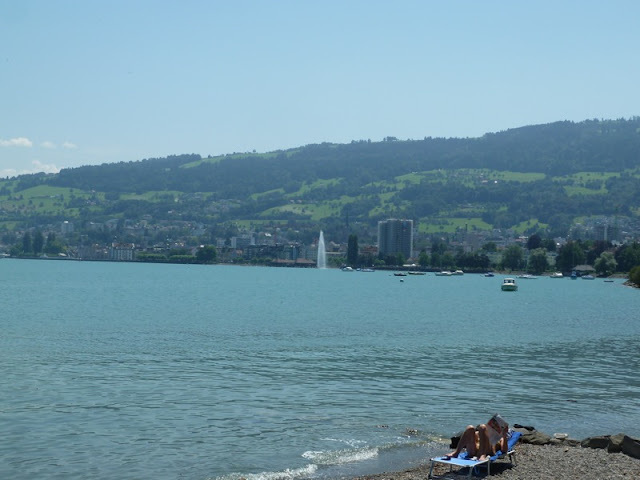 Bregenz, where I go tomorrow is at the eastern end of Lake Constance. 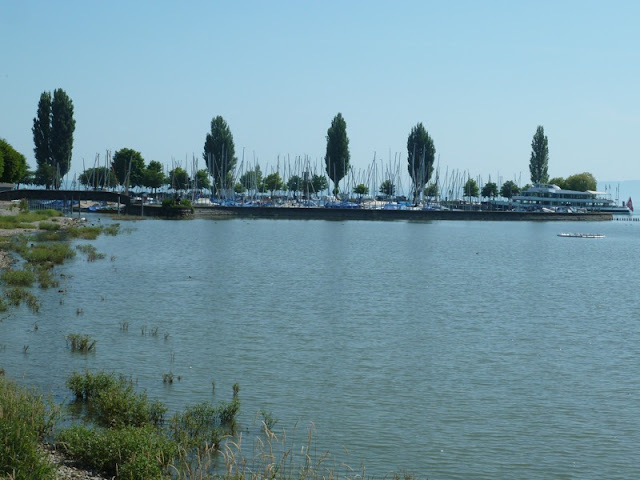 To get to it however you have to cross the Rhine again (flowing into rather than out of Lake Constance). This involved an annoying walk south, and I think I have to go a bit further south tomorrow, before heading north east to Bregenz. The Rhine forms the border with Austria. Looked very slow moving and muddy today. Not sure what that post is doing, dodgy composition or what, I blame the heat. Found your site 'by accident' when researching the GR7, a path I walked a few miles along whilst in the Sierra Nevada last month. My interest was piqued when, having never heard of the GR7 until then, I realised it allegedly went @from Spain to Greece'. On the return flight, I began pondering how long it would take to walk the whole length, and whether anyone had actually done it before. So, hear i find a fellow 'mid-fifties' guy doing precisley that; good on 'yer chum, sounds a fascinating way to see that part of the world, and keep the ageing process at bay...good luck, I shall now be following your progress with great interest.